The news that Lego was making a new original theme called Elves was exciting from the start. Lord of the Rings is what brought me into Lego again, and customizing fantasy characters, including elves, would certainly find many more possibilities with new characters. I was only slightly disappointed that it turned out to be a third series using minidolls, like Friends and Disney Princess. However, the theme itself looked amazing. Elves uses tons of distinct colours with lots of earthy tones and purples to create a fairytale world that doesn’t really look like anything else Lego has ever done. 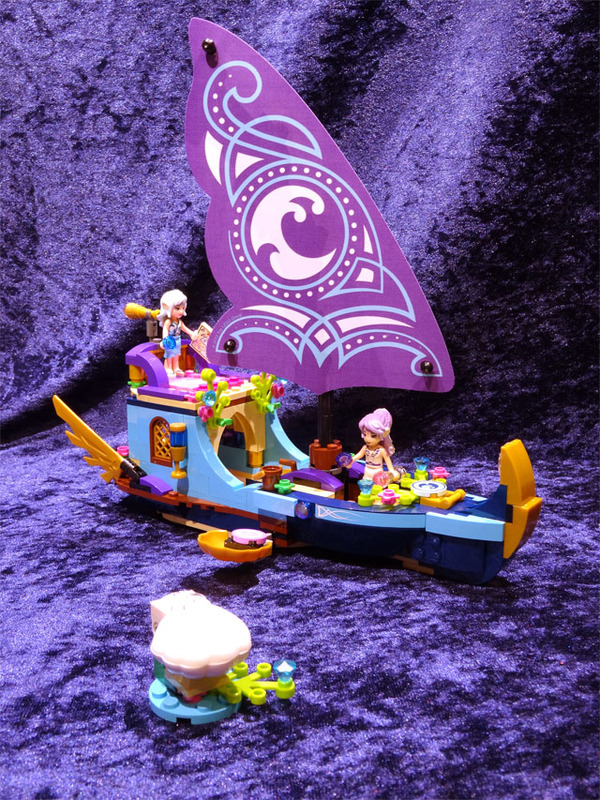 I’m certainly planning to buy more of the line, but as it turned out, I found Naida’s Epic Adventure Ship first. As a 304 parts set, it’s not huge, but I’m happy to see that all parts have a good use. There’s practically none of the standard miscellanous accessories that plague the similar themes. Aside from the seashell which holds the key that the adventure is all about, all parts go into building a really neat ship. 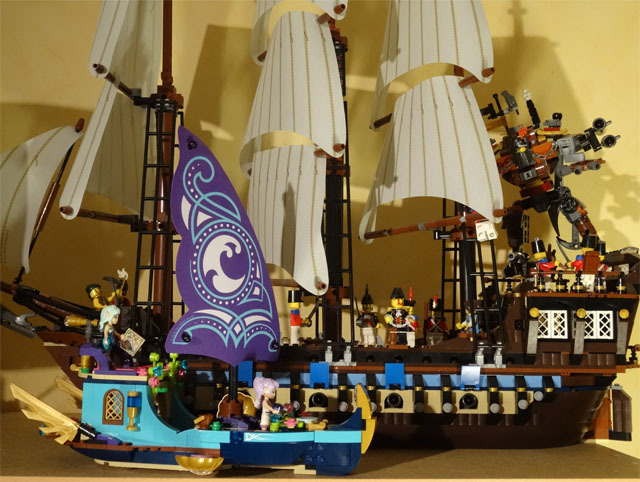 While it’s hardly anywhere near the pirate ships, it’s still a decent size, and above all it’s a great build. Some rare dark blue parts go into building the hull, which is very complex. The bow is mostly built sideways and attached to a frame, and there’s a small but impressive mechanism that makes the sail movable by a navigator. There’s a few more stickers than strictly necessary, but they add nice detail and the only real cheating is on the big dark blue slopes along the front. While small, the ship still allows room for plenty of figures in the front and rear parts of the deck, inside the open cabin, at the rear deck which has kind of a relaxation area complete with a springboard, and finally up on the command deck. Once you get the complete set of characters, they can all go on a trip with this. Speaking of characters, this set gives us Naida and Aira, and I don’t need the colour schemes to tell me they’re related to water and air. Naida has mint green hair with some nice toning into blue, while Aira has light purple with a tint of white. It’s nice to see Lego doing new faces on minidolls, as these have a more interesting expression as well as tons of tiny detailing. This continues on the clothing, which has some of the finest detailing I’ve ever seen on a Lego figure. The gold on Aira’s midsection is truly exquisite. This set strikes a good balance between getting value for your money and still being small enough to fit anywhere. It’s a very interesting build, and the final result is gorgerous, as are the figures. Even as a parts pack, it’s interesting with useful dark blues (including some 2×6 bricks), lots of purple curved slopes and pearl gold details. It also includes one of the new elven railings which is hidden away behind the command deck, something I hadn’t spotted before. Not only is this a great set in and of itself, it’s also a great template for building your own small ships. Highly recommended!